Shoes are awkward. You can&apos;t fold them, stack them or hang them up. It&apos;s like they have a mind of their own and somehow always seem to end up in a disorganised shoe mountain! Here&apos;s a quirky but practical idea to keep some of yours out of sight, but always within easy reach. Storage opportunities are hiding everywhere, even in your wardrobe! This idea makes use of the dead space on the inside of your wardrobe doors, and all you need to get started are a few tennis balls and a pack of Sugru... game on! 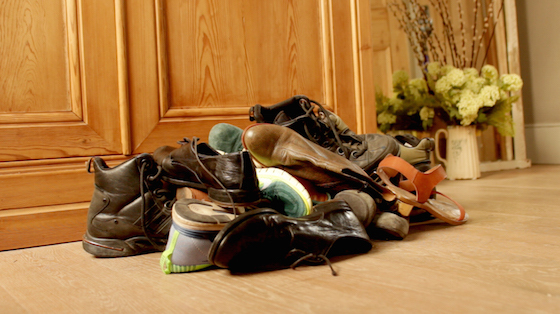 Copy this genius little idea and you&apos;ll have your shoes under control in no time. Turns out tennis balls make great shoe hooks — they&apos;re soft, round and kind on your shoes, plus you can get them easily. 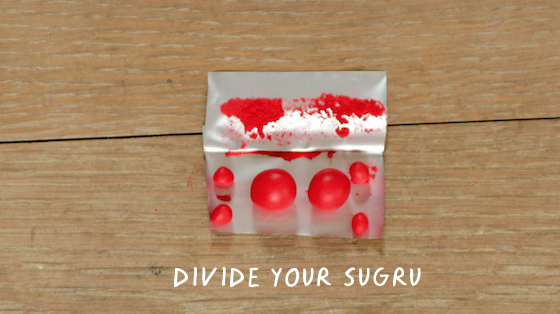 Unlike other glues, Sugru is three-dimensional and fills weird gaps, so you can stick odd shapes together. And because Sugru is removable you can take them away again in years to come, if you ever need to, ideal if you&apos;re living in rented accommodation. One single use pack of Sugru is enough to attach two tennis balls and store a pair of shoes. Need to stock up on Sugru? Head over to the Sugru shop. Step 1 – Smudge one pea-sized piece onto the tennis ball and the other pea-sized piece onto the wardrobe door where you want to attach the ball. Step 2 – Roll one of the large pieces into a sausage, press onto the smudged part of ball and shape into a pyramid. Step 3 – Press the tennis ball onto the smudged Sugru on the wardrobe door and press down firmly. Top tip: Use tape to secure the tennis balls overnight while the Sugru cures. In 24 hours they will be ready to go, and can say goodbye to that shoe mountain! We all like to be as independent as we can, even when we’re too small to say so. 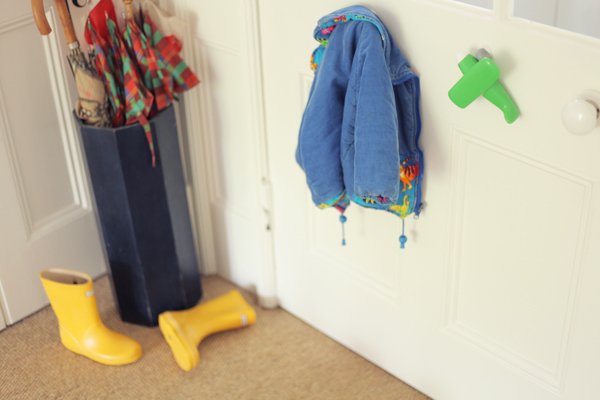 This practical and quirky idea lets kids hang up their own coats by simply putting a hook at the right height for them. Outer order, inner calm. 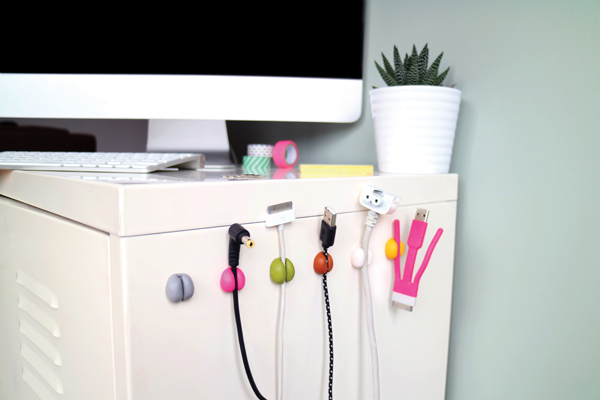 Desks, TV’s and bedside lockers are a cluttered mess with all our cables. Well no more. This clever home hack will organise cables neatly and keep them within easy reach. Say goodbye to your spaghetti cable mountain! Yes please. There are two sides to everything, and shelves are no exception. Solve key chaos with Sugru and a few humble magnets. Your keys will snap on and off, and you’ll find them satisfyingly suspended, waiting to be grabbed at the start of the day. Why stop there? 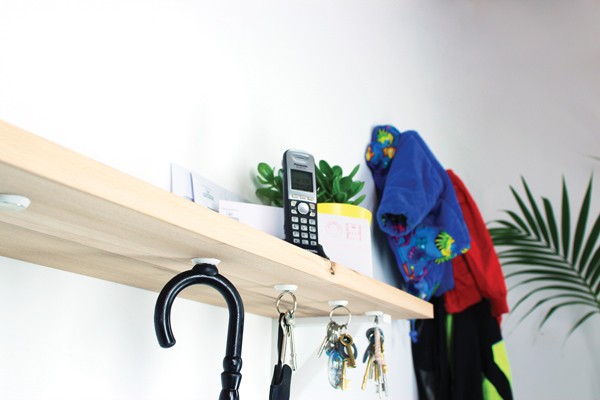 Head over here for loads more Sugru projects to organise the spaces around you. A great way to conquer spaghetti cable mountain with Sugru cable grips. With Sugru and magnets you can keep your torch where you need it.